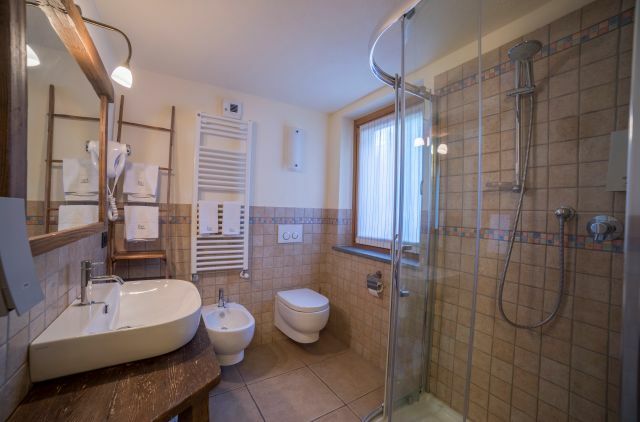 Small and pretty STANDARD room with balcony. 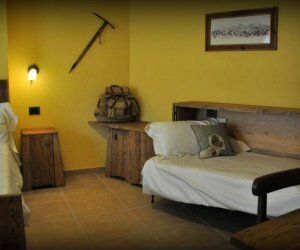 It is dedicated to all mountain lovers and is furnished with some precious objects which once belonged to Manuela’s grandfather. 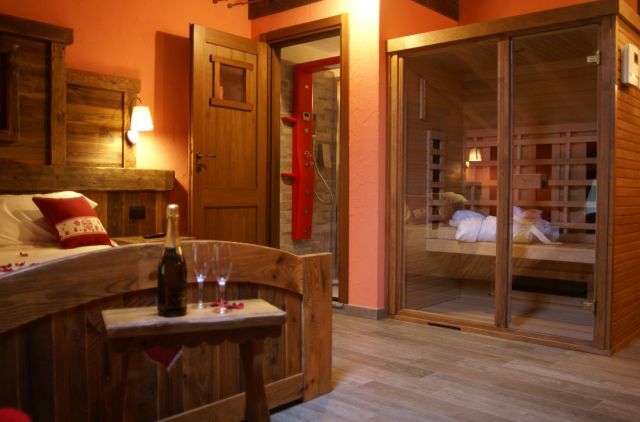 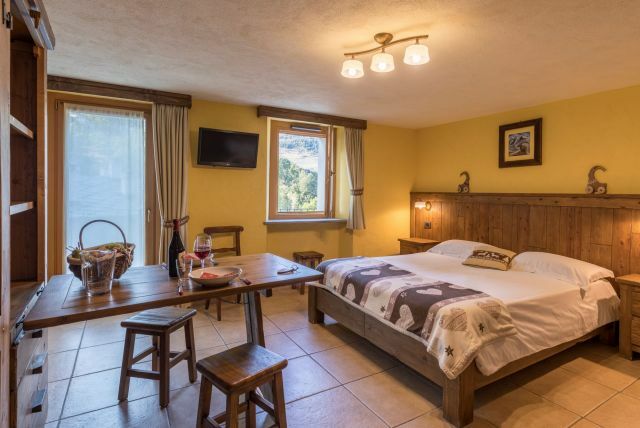 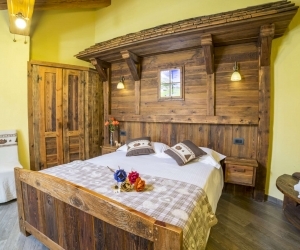 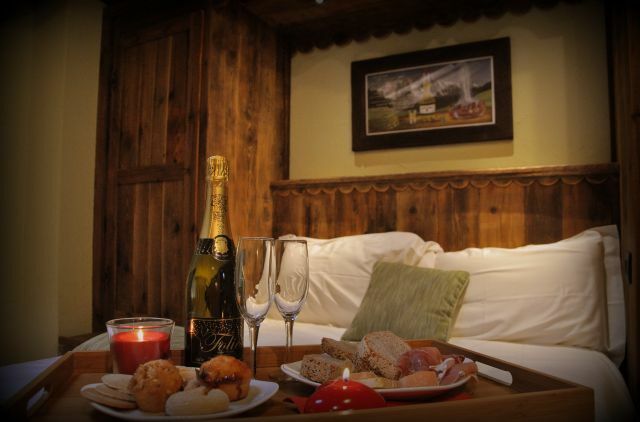 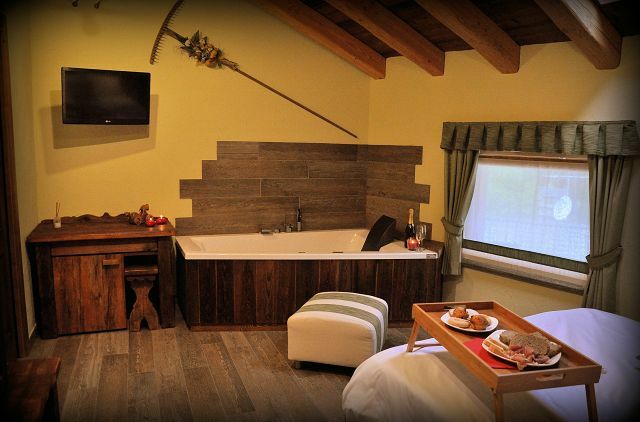 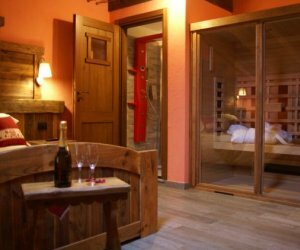 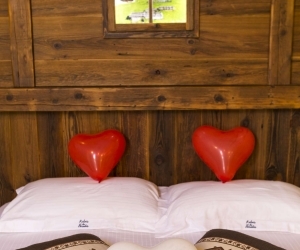 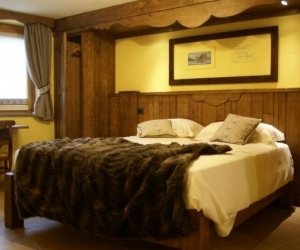 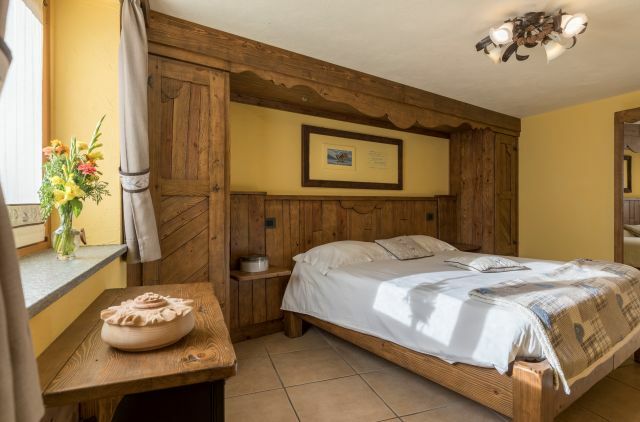 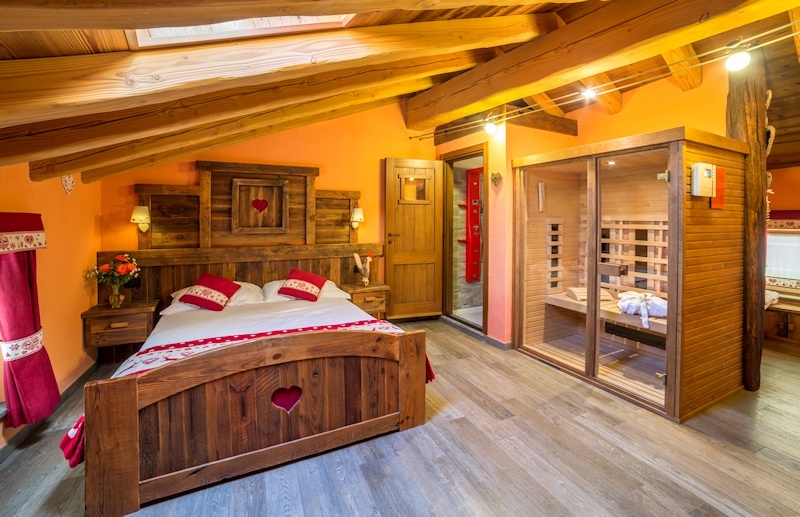 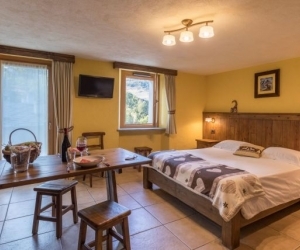 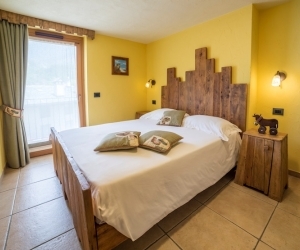 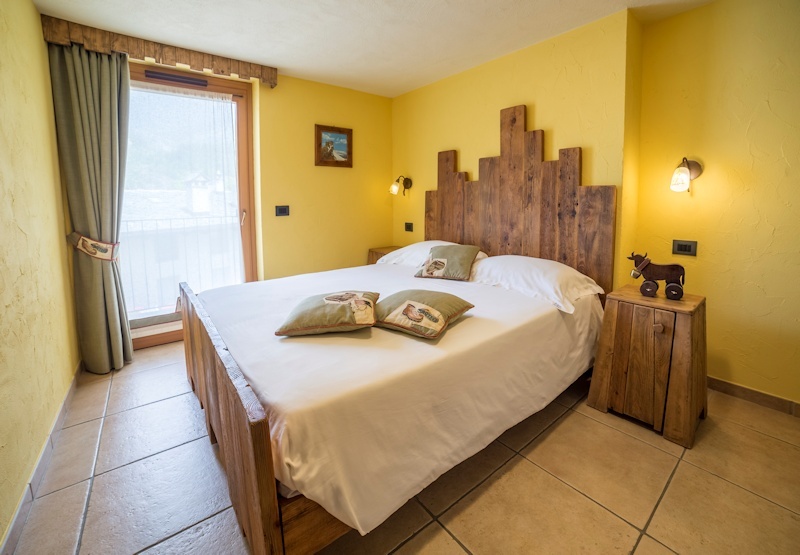 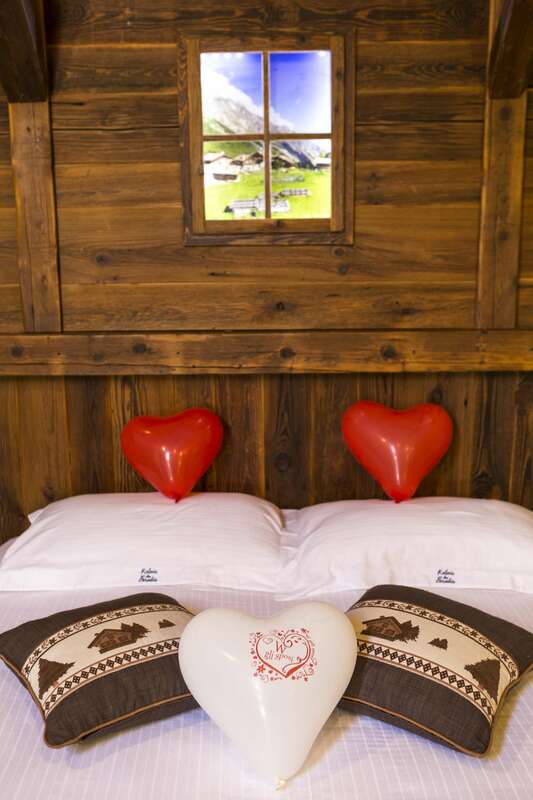 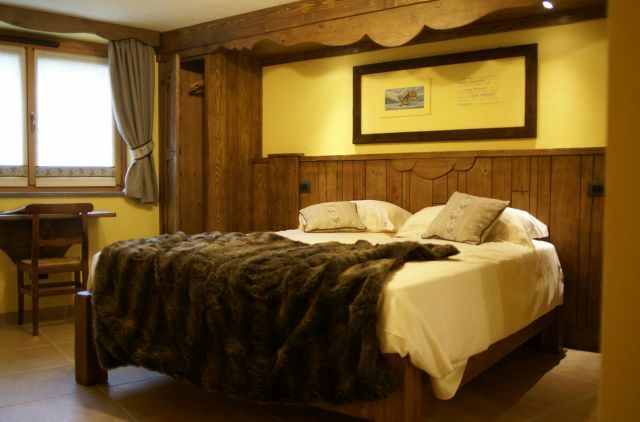 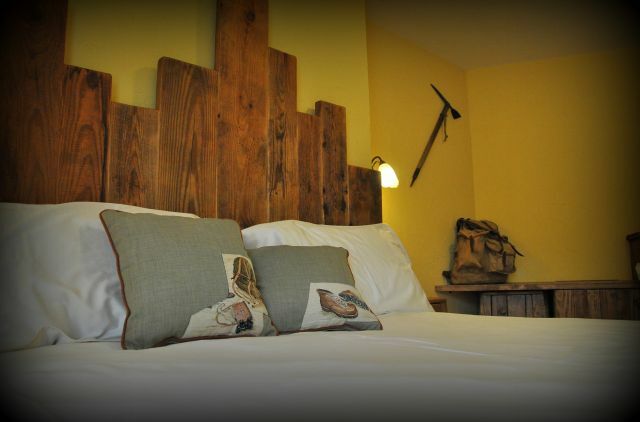 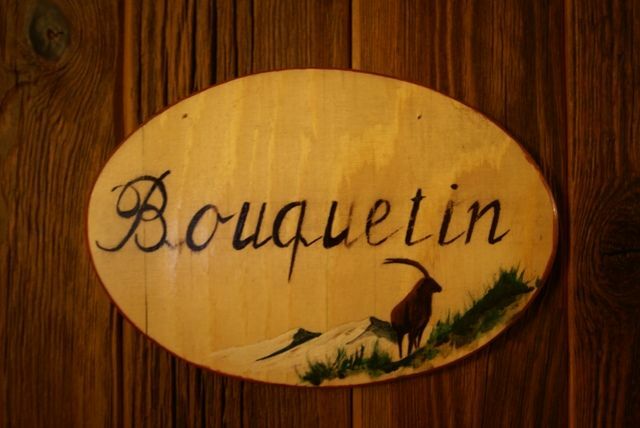 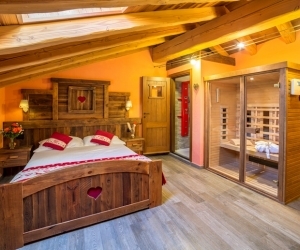 Large STANDARD room with balcony, dedicated to the symbol of our Valley: the alpine ibex! 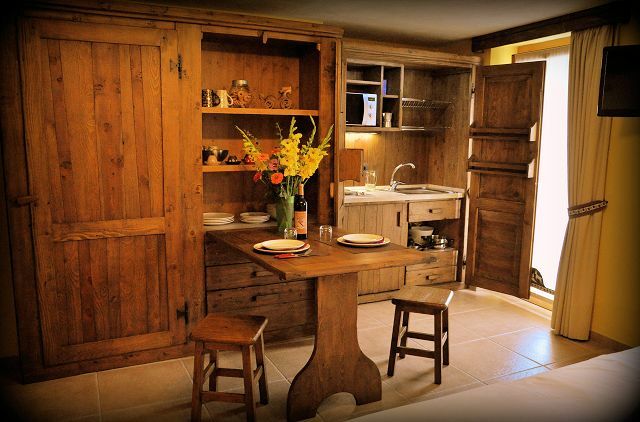 This room is equipped with a small kitchenette and a folding table hidden inside a wooden cabinet. 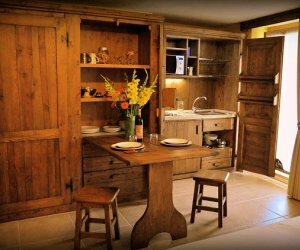 It has two electrical fires and it is ideal for mothers who need to prepare meals for their younger children. 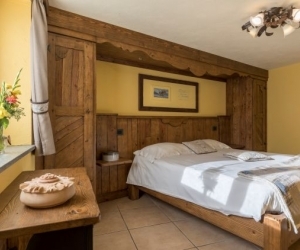 Two formulas available with this room: “residence” or traditional bed and breakfast. 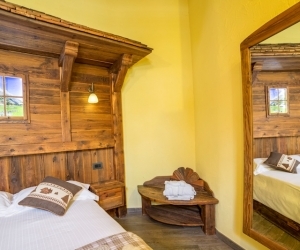 In this room, in addition to the double bed, hidden in a wooden wardrobe is a bunk bed. 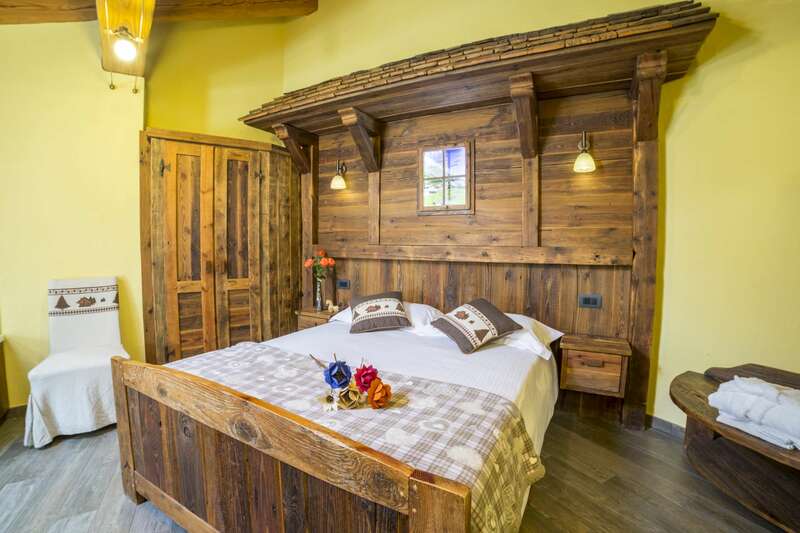 Green painted SUPERIOR room with French bed (140 cm). 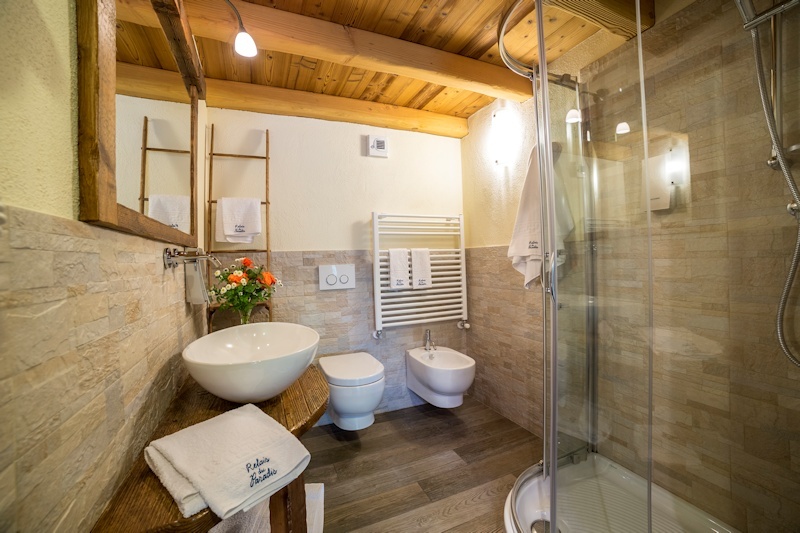 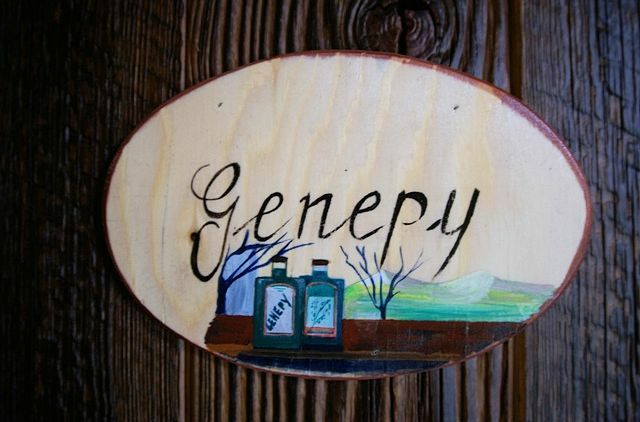 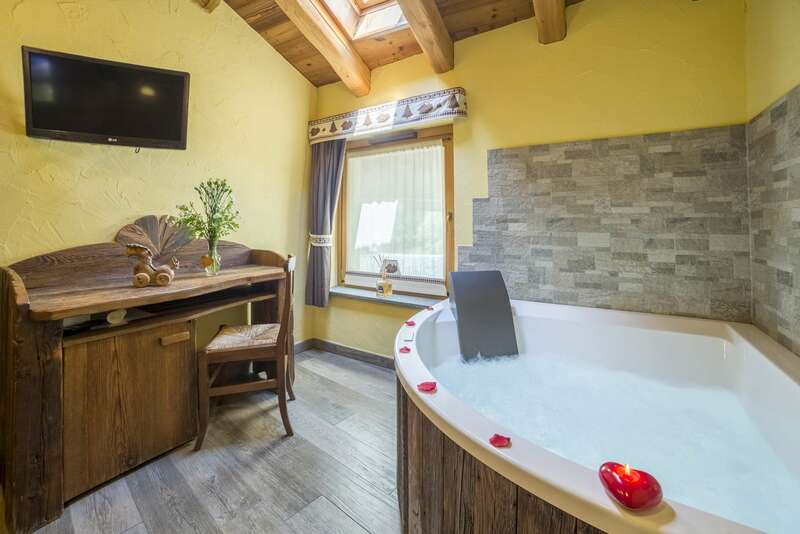 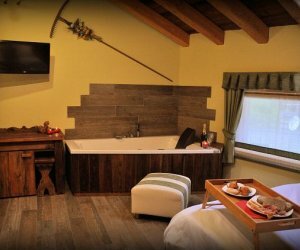 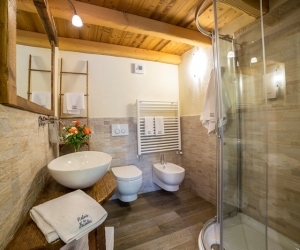 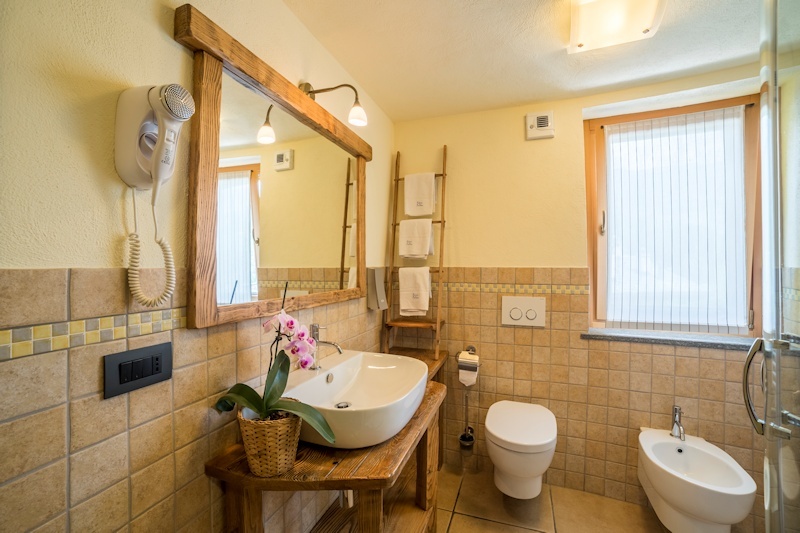 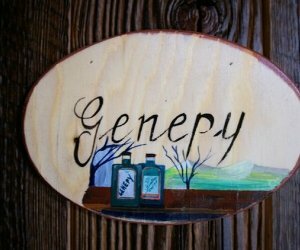 It is equipped with a Jacuzzi and is named after Genepy, a local plant growing wild in the Alps (also in the Gran Paradiso National Park), above 2000-2500 metres. 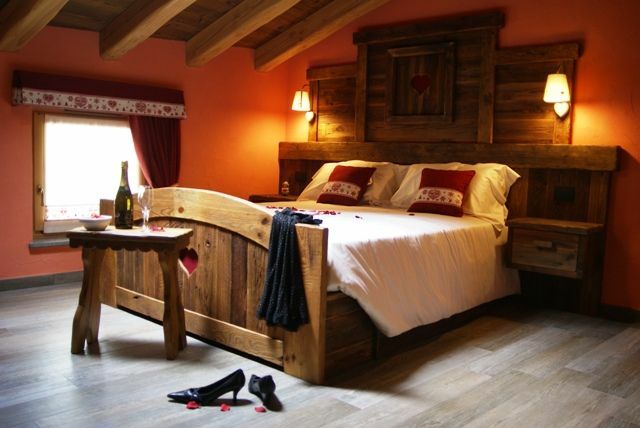 This room is ideal for an intimate and relaxing stay. 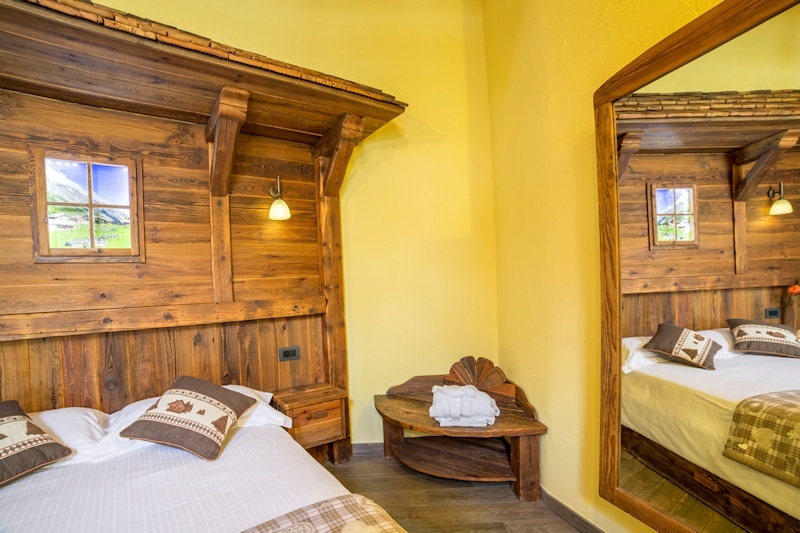 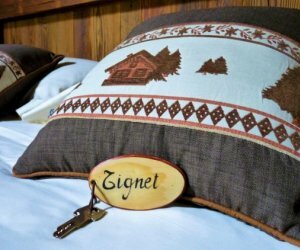 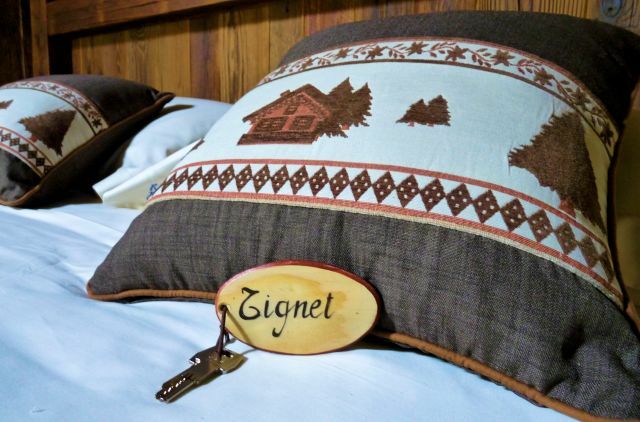 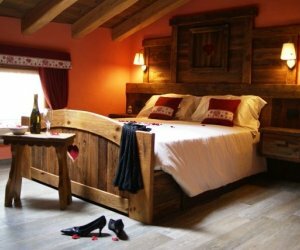 Welcoming and traditional SUPERIOR room, its peculiarity lays in the little wooden chalet and the sloping roof built inside it which makes it look like a mountain lodge. 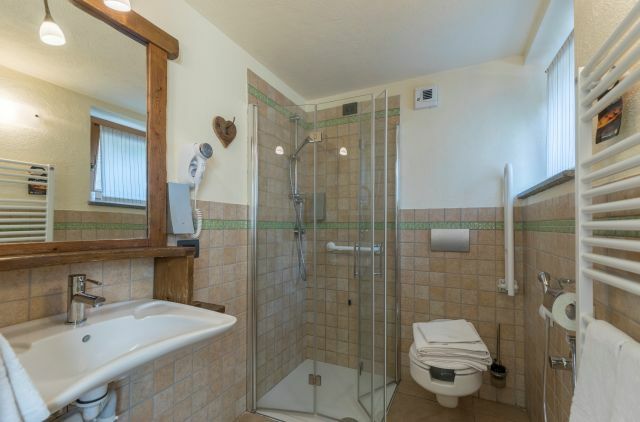 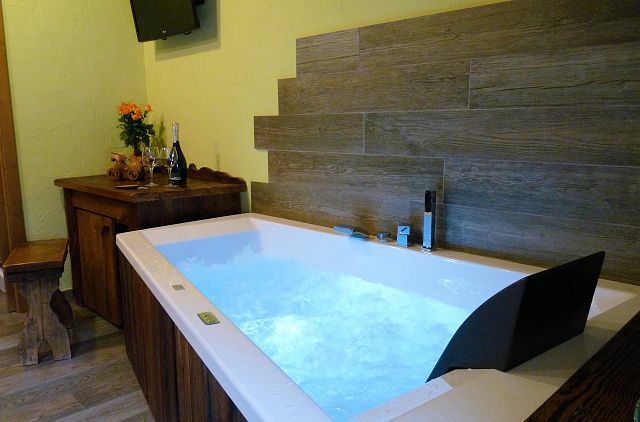 At the foot of the bed is at your disposal a large two-seater Jacuzzi. 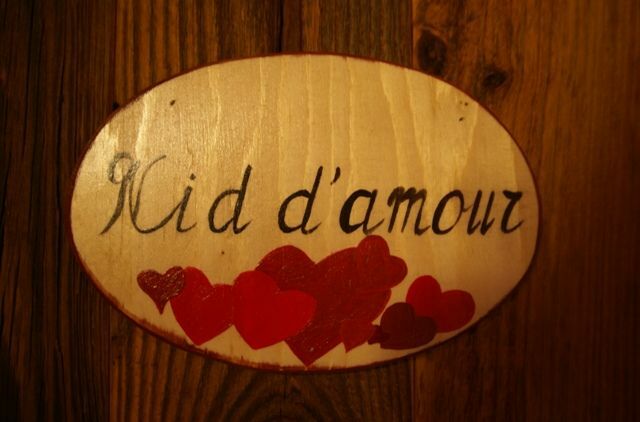 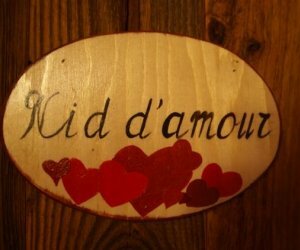 It is dedicated to all those people dreaming of a small haven of love for special occasions. 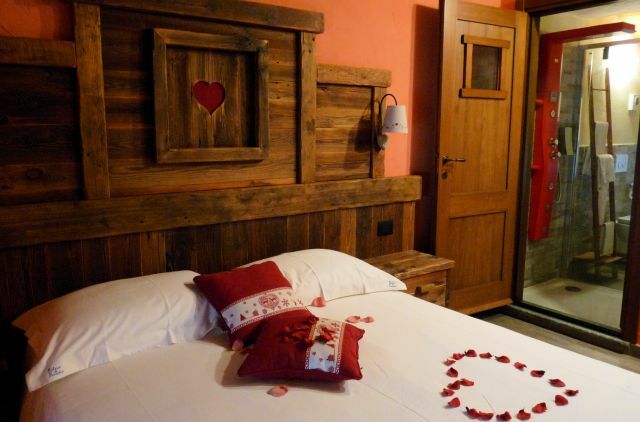 SUPERIOR room dedicated to all the people in love. 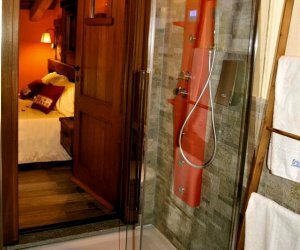 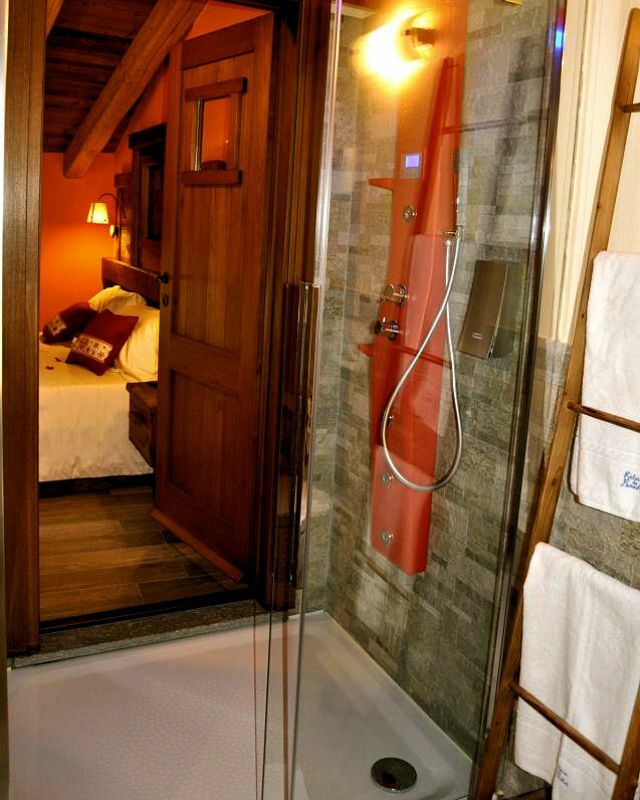 It features a large hydro-massage shower with chromotherapy and a comfortable infrared sauna made of birch wood. 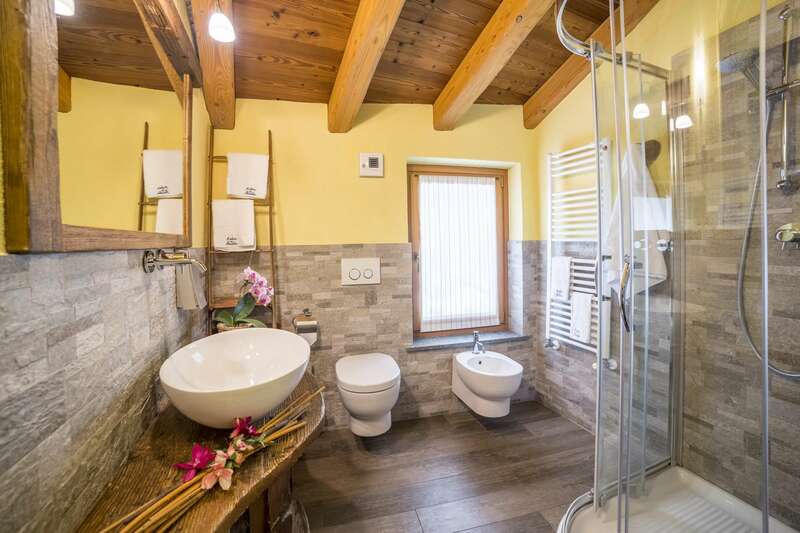 An oasis of privacy, it is ideal for relaxing moments. 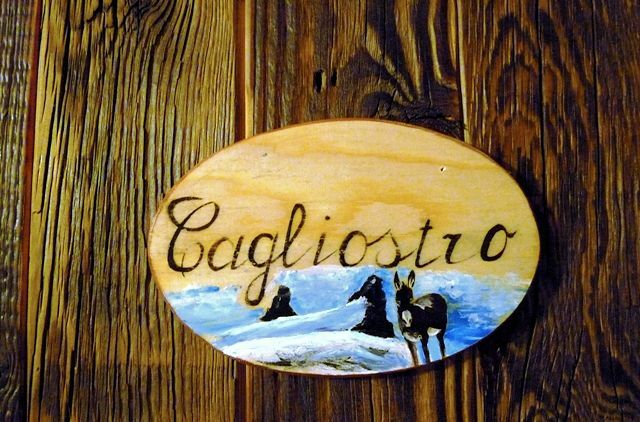 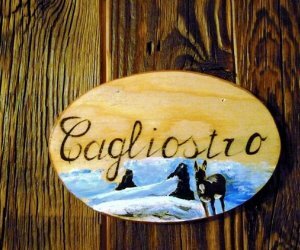 This TYPICAL room takes its name from the friendly little donkey Cagliostro who, accompanied by his master, reached the summit of the Gran Paradiso. 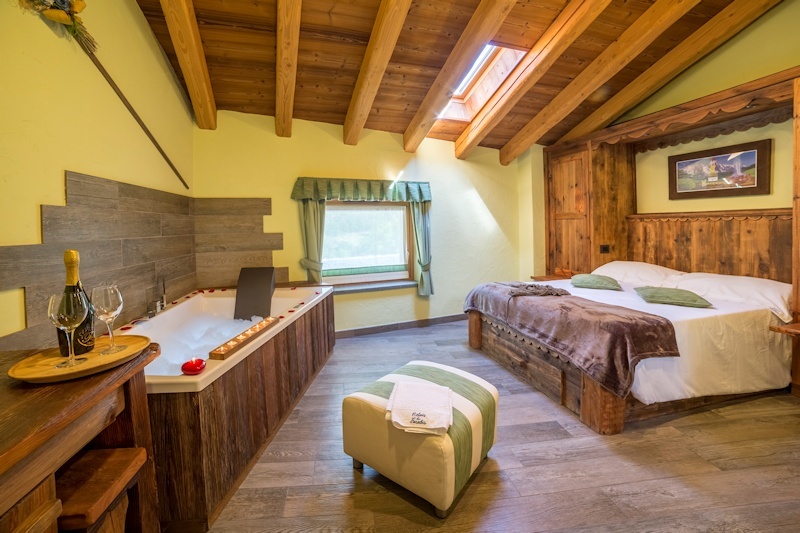 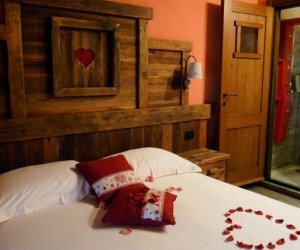 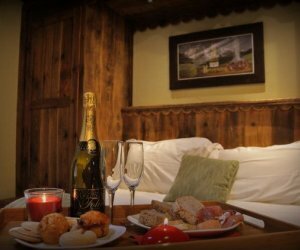 The rooms are all different from one another and in each one of them you will enjoy a warm and welcoming atmosphere recalling the mountains and the past, without giving up modern comfort. 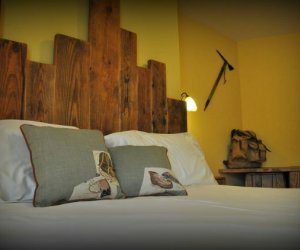 Which room will make your stay unique? 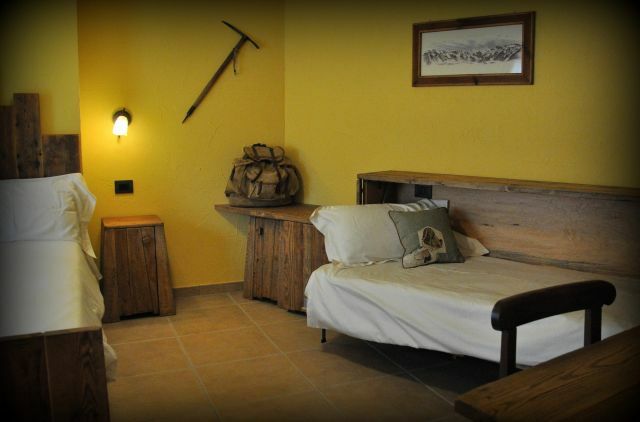 Learn about the different environments and… choose! 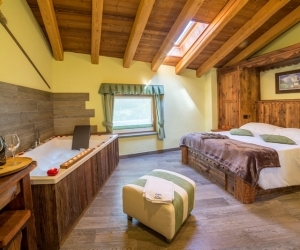 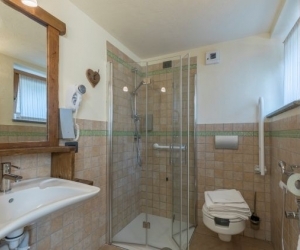 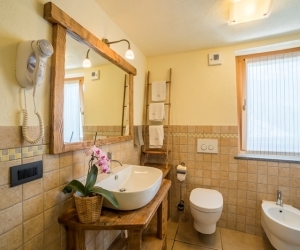 All rooms are completely custom-furnished using fir and larch woods and traditional patterned fabrics, they are equipped with private bathroom, hairdryer, safe deposit box, minibar with soft drinks (with the exception of one room), air ventilation for air circulation, Satellite TV, free Wi-Fi, complimentary toiletries. 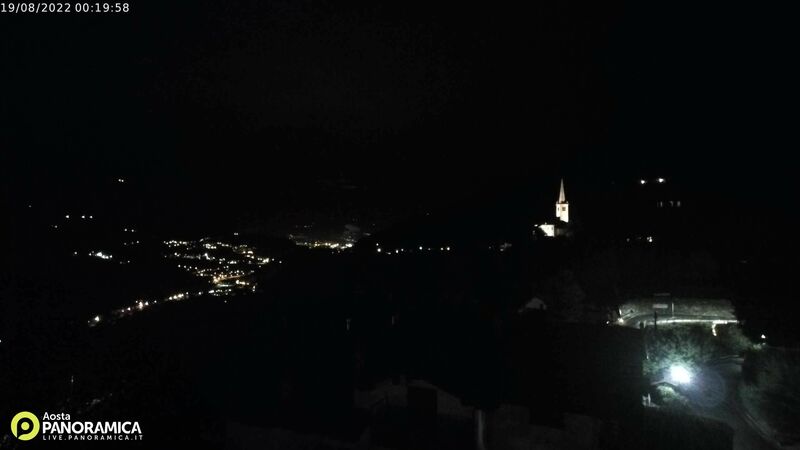 Communal parking a few meters. 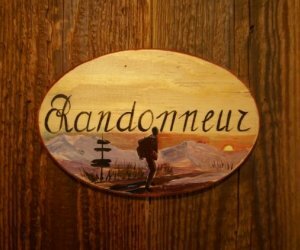 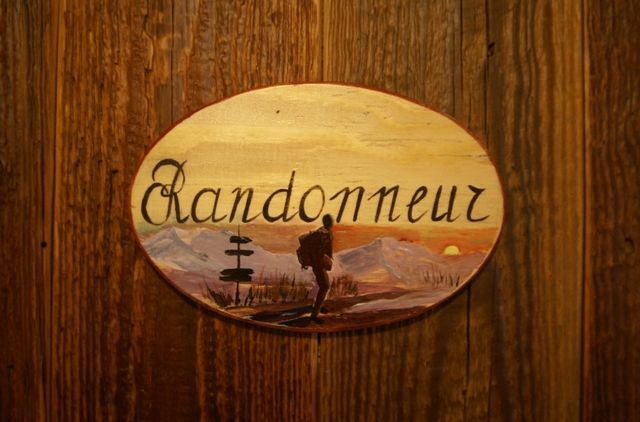 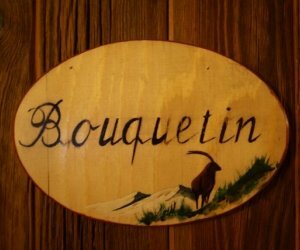 Small pets allowed subject to availability in RANDONNEUR and bouquetin rooms (surcharge) - see page prices.